Stunning and talented 7 yr old mare! Delilah is a big talent for the future! She is ready to show First level and schooling Second. With a very correct conformation and comfortable gaits to sit, she is a joy to train. Delilah is a quick learner and always tries to please. 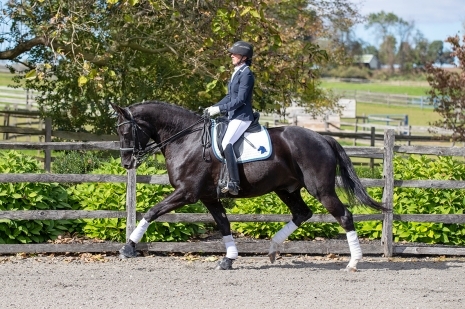 She gives a steady contact and rhythm, and is a naturally forward thinking horse. She is very sweet in the stable and is easy to handle. No vices, no soundness issues. The full brother if her dam, also still young, has had scores in 1st and 2nd level up to 77%, and has been invited to the US Finals for two consecutive years with his AA rider. Owner must reduce the herd, and as a result this high quality horse is being offered for sale well below her value.